It was with great pleasure and satisfaction that we had to originally hurry this tour before we had planned to cover this subject. Tour Eight helped many people care for turtle eggs and the email shifted to how to feed baby turtles, especially baby box turtles. Feeding larger turtles will be addressed in a separate tour. Turtle foods come in a variety of shapes, sizes, and ingredients. Some even walk and hop by themselves. 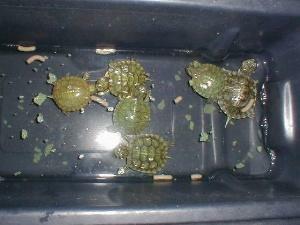 There are flake and small pellet foods sold just for baby turtles and these are good for starting baby water turtles. Turtle sticks are the most common turtle foods on the market and are good for feeding all turtles including baby land turtles like box turtles. Larger floating pellets are sold for water turtles and are good for all turtles including babies. Dried whole shrimp and dried bugs are sold and are of questionable value; we don't use them. There are pellets sold for box turtles which smell like apples and really do smell good. However, we have yet to have any of our turtles eat them. There are shrimp pellets (gammarus) intended to be used for a treat or supplement and are not sufficient as a main diet food. The processed whole foods in flake, stick, and pellet forms all have the necessary vitamins and nutrients turtles need. Vitamins are absolutely critical to good health. When the dime store baby turtles (red-eared sliders) were common when I was a boy, dried ant eggs were the common food sold for turtles. In fact ant eggs were the only food I remember ever seeing. They ate them and most died because they never received the vitamins and nutrients they needed. That is why we do not use dried shrimp and dried bugs. Fish foods have about the same ingredients as turtle foods. There are differences to be sure. For our purposes we consider fish foods excellent substitutes. We would not recommend purchasing baby turtle flakes and small pellets if you already have fish foods available. We purchase large pellets in plastic bags sold for pond fish like Wardley's Ten. This is an economical why to feed many turtles a good main diet. Some live foods are sold like crickets and mealworms which are good. Feeder fish sold for feeding big aquarium fish are available. Turtles can become infected with parasites from feeder fish and most feeder fish are too large for baby turtles. We do not use feeder fish. We do not purchase earthworms sold for fish bait. They are probably okay but we do not trust them since they are not intended for pet consumption. We would only purchase earth worms from a pet store if we were purchasing earthworms. Most earthworms sold are much too large for baby turtles anyway. There are also canned turtle foods. We have never tried them and the quantities of one can would be far too large for baby turtles. Forget veggies and fruits for baby turtles; they don't eat them. We never feed any turtles raw meats such a ground beef or raw poultry. Both have too much fat and harbor salmonella. Raw seafood is okay for water turtles, but we do not use seafood. Cooked poultry and cooked eggs including the shells are acceptable for turtles after they begin growing. Before we go any further, we want to inform new viewers and remind other viewers to read all the tours carefully. Much of what is presented here is covered or elaborated on in other tours. Some material in other tours will be more applicable to your baby turtles once they start growing. Okay enough background info. Here is how we feed baby turtles. We like to start our baby water turtles by giving them several types of food together. We give them flakes, small granules which usually sink, and sticks or pellets. Once they start eating and growing, we gradually stop feeding them flakes. No big deal here on any of these foods. All are good and any one alone will do. Large pellets are broken into pieces. Our intent is to get them to eat something and then move them to sticks or pellets. Water turtles must be in water to swallow. Spotted turtles should be treated as water turtles. 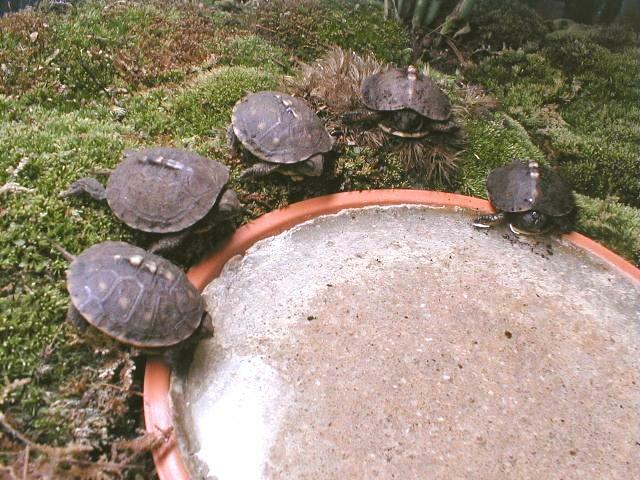 Wood turtles may be treated as water turtles or land turtles. Like we show in Tour Two we always feed water turtles in a separate container of water in water drawn from the water they are housed in. Just enough water to cover the turtles is enough. There are many reasons to do this. First it keeps all the dirt (uneaten food) out of the aquarium. Secondly the water is the same temperature. We don't want to shock them with cold or too warm a temperature which can harm them or cause them not to eat. It also conditions them to a feeding event and to being handled regularly. Baby water turtles will be slow picky eaters at first. We feed them every day. We give them 30 minutes to several hours (we often forget them). As they grow, they eat more quickly. We feed them all they want to eat. We discard the water and leftover food but take care not throw the babies out with the water. We do not expect to see them eating while we watch them! In Tour Two we stated that we pat dry each turtle as we move them back to the aquarium. There is not much to pat dry on babies. The purpose is to remove bits of food sticking to them and to take a closer look at them to see if they are in good health. We do not provide a lamp for heat and basking. 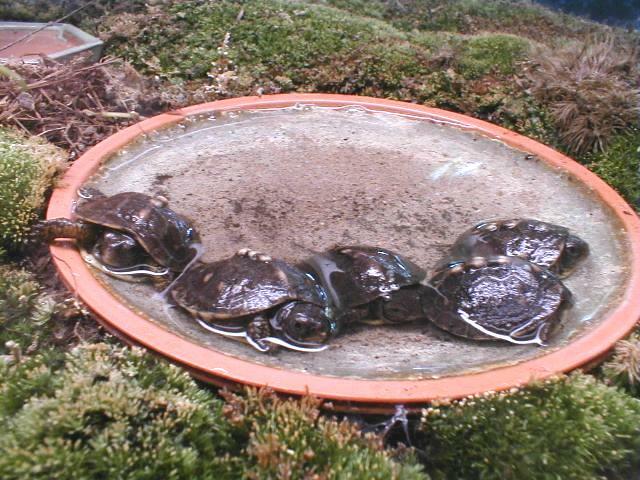 Larger water turtles outdoors usually bask before and after eating. Babies are so small that they are going to be the temperature of the water they are in. And, they are very susceptible to over heating. We have never found a heat lamp to be necessary or practical. If they don't start eating in about a week or stop eating, it may be due to their aquarium temperature. We use an inexpensive aquarium heater to keep the water temperature in the mid to high seventies. They will not eat if they are too cool and will not digest their food if too cool. If they still don't eat we increase their temperature into the low eighties. We don't just trust the setting markings on the heater; we also monitor temperature with an aquarium thermometer. Some babies may never start eating and live many months. Some turtles stop eating after a good start. In these situations we first check the temperature. If we don't think temperature is the problem, we try placing the turtle in a small container of water not much bigger than the turtle. In the water we put a squirt of stimulant which is basically vitamin A. 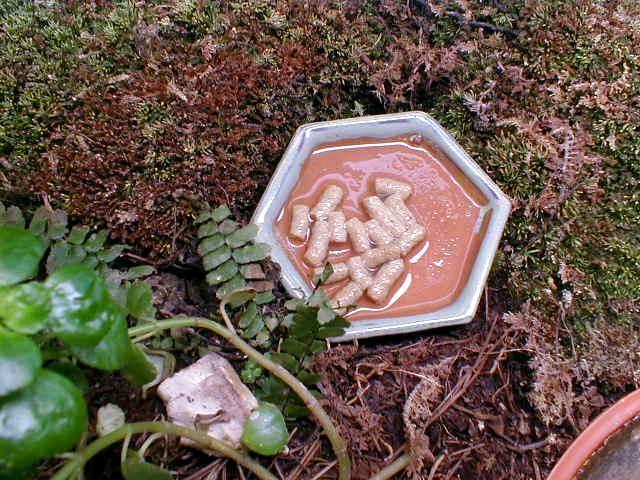 Reptile stimulant is sold in many pet stores. This is repeated everyday for about 30 minutes before regular feeding with other turtles until the turtle hopefully starts eating. Remember, not all eggs hatch and not all baby turtles survive. One early sign of trouble to watch for is a turtle that floats unevenly in the water. This may occur after they are eating and growing well. Immediately increase their water temperature into the low to mid eighties and give them stimulant or vitamin supplements. Expect the worst and work to achieve the best. If our baby turtle is an adorable snapping turtle or other species that may have a tendency to bit when it is older, we do not feed it by hand. It may forever associate our fingers with food. It is better to associate getting picked up with moving to the feeding container. 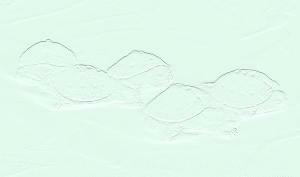 Also see Tour Eighteen: Starting Hatchling Water Turtles. Feeding baby box turtles may seem like a difficult task at first especially if you watch them and expect to see them eating. First lets discuss age. Baby turtles may not leave their nest underground until the following spring. This is widely written about. What is not written about is what they live on during this time. Even babies hatching from eggs buried completely and placed in an incubator will take time to emerge. Babies hatching from eggs like ours in Tour Eight are many days younger than they would naturally have been when emerging from the ground. So we hesitate to say how soon we expect to see them eating. Secondly it is natural for these tiny turtles to remain hidden from our view for years. So we must expect them to hide from us at first. Therefore, we cannot expect to see them eating just because we put them in front of food. We know they will dig under and hide when we place them in a vivarium; going underground is completely normal. So how do we feed them and how do we know they are eating? Here's the long answer. Our 20L aquarium was last shown in Tour Six: In the Leaf Litter. 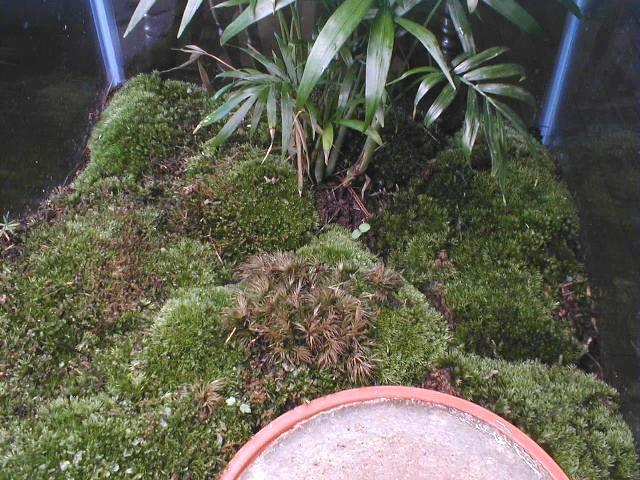 In preparation for our baby box turtles, the leaf litter was removed and new moss was added to cover all the soil. The baby turtle safe water dish shown in Tour One was reinstalled. The food dish remains the same. When we placed the five baby box turtles in this vivarium about five days after they hatched, we placed several large pellets of food on the dish and moistened them with water. The turtles found hiding places as expected. Each day they were given clean water and fresh food. After just a few days it was obvious that the food was being eaten. That does not mean we saw them eating; we don't. What to do next. Basically we will follow what we have presented in previous tours. At least once a week we round them up for a soak in a container of water not deep enough to swim in. This gets them moving so we can check them. We may offer them pieces of tiny worms and small bugs while in the water usually with no takers at first. This routine will be followed with patience. Some food is also placed in the water bowl since clean water is provided daily. Land turtles can eat in and under water. Some box turtles enjoy eating in the water bowl and will chase bugs and worms in the water. We find that many box turtles are early risers. They like moving about at first light of the day and earlier when we get up for work and turn their light on. Some start by moving to the food so we feed them first thing in the morning or put fresh food in just before lights out. If they ask for more food during the day, it is provided. We feed them Wardley Ten Pond Fish pellets and Reptamin sticks together moistened (flooding the dish) with water. Small pellets or flakes tend to be just mush when moistened so we like the larger pellets and sticks. Again no veggies or fruits; they develop a taste for them later in life. And no meats and junk food. Once they start on sticks and pellets they will be better off getting the same everyday for awhile. Like kids they many become fixed on a brand or type of food which is okay. If we were just feeding baby turtles we would purchase Wardley Reptile Sticks. Misting the vivarium helps get them moving just as adults move about after rain. They need the humidity. 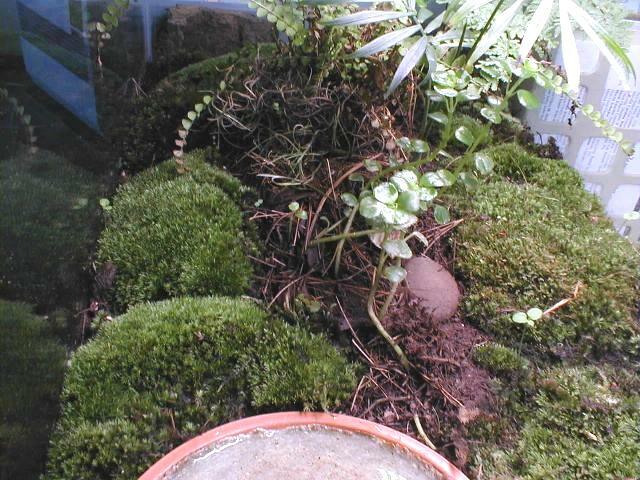 Caring for the plants also draws our attention to the vivarium and how the turtles are using it. You can make a wash bottle by taking a plastic spice bottle and drilling or punching a small hole through the lid. Start with a very small hole and increase it until you are satisfied with it. This is a good why to dispense limited amounts of water to moisten food and to mist plants without spotting up the aquarium glass everyday. Our baby box turtles are kept at room temperature all year round with no added heat source. An aquarium light with a grow bulb is used. It adds very little extra heat. If we feel the need to increase their temperature, we cover the light and aquarium with a bath towel to hold in some of the heat from the light. We have tried heating pads and hot rocks and find them of questionable value. As stated in other tours, location and speaking to them are important. We are really conditioning them from the start to be active visible turtles. So we want them to know us and expect our presence and attention. This takes longer with land turtles than water turtles. Baby turtles are heart grabbers. You can't help but fall in love with them. And it hurts to loose one which is a high probability. We prefer to raise two or three together rather than just one. For this reason two of our baby box turtles moved to another home to join another baby box turtle just months older. That is not to say that we would not have kept all five or many more together. We had another batch of eggs incubating which may be siblings to this five. New arrivals join the group. We also mix species together. In Tour One we had a spotted turtle baby with box turtle babies. There was enough water in the water bowl for it to eat for about a year. We also mix species of water turtles together, even snapping turtles and stinkpots. Most turtles of similar size of different species get along together at least when babies. We are pleased to have babies to put up for adoption from time to time. We always recommend taking more than just one. We do not want to see people invest the time and emotional attachment to just one baby who has the odds against it's survival to adulthood. Just because these babies are in captivity does not change nature's design; many eggs are laid for a few to survive to adulthood. Baby and juvenile turtles may be fed all they will eat. Basically extra nutrition goes into growth not fat. It is possible for small turtles to get fat if fed fatty foods like mealworms and not enough foods with vitamins and minerals. We like to mix brands of foods and provide supplements like bugs and earthworms. Variety is always good and may also be entertaining. We hope you enjoyed our tenth behind-the-scenes tour. Come back again.